“There is literally trillions of dollars’ worth of infrastructure around the world on ground that is at risk of liquefaction,” said Edward Kavazanjian, a Regents’ Professor and the Ira A. Fulton Professor of Geotechnical Engineering at Arizona State University’s Ira A. Fulton Schools of Engineering. 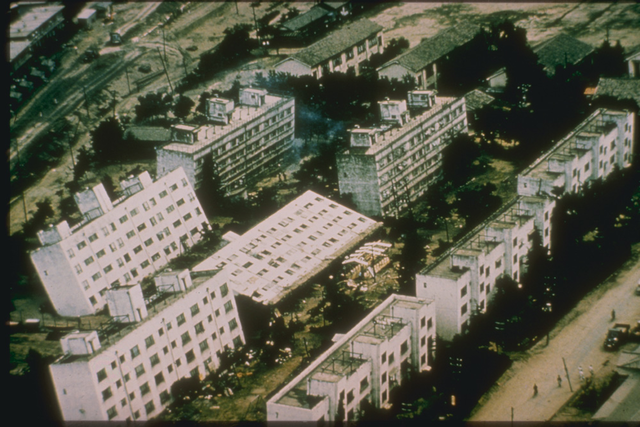 “We have conducted a comprehensive study that tells you the best practices that the experts know of to assess what is likely to happen if liquefaction occurs and to guide decisions on what to do in the way of prevention, mitigation and remediation,” Kavazanjian said. “We’re expecting standing-room-only crowds,” Kavazanjian said. Kavazanjian said completing the report has been a challenge because the authors ultimately had to accommodate the viewpoints of differing schools of thought on the optimal methods to address assessment of the potential for liquefaction and the consequences of its occurrence. “The 11-person study committee had to reach consensus on its recommendations, which were then subject to a high-level of peer review in accordance with National Academies policy,” he said. Has the new year put you in a goal-setting mood? The center, launched in October 2012 and part of University College, has been helping ASU freshmen and sophomores dream big and accomplish their goals with personalized peer-coaching – supporting more than 21,000 students in 50,000 coaching appointents, to date. “Our focus,” said center founding director Marisel Herrera, “is easing their transition to university life and developing the skills and connections that will help them persist to graduation — and thrive along the way. At ASU, coaching visits are free, entirely optional and students set the agenda. During the fall 2016 semester, 3,944 ASU students were served in 8,488 coaching appointments — in-person and via email, phone, and Skype. The center reached out to more than 9,000 freshmen and sophomores with personalized invitations, encouraging them to take advantage of the free personal coaching. Rachel Walker, an ASU junior from Pennsylvania who now works in the center as a coach, remembers what it felt like to be a freshman hesitant to come in for an appointment. The global politics and supply chain management major said it was the lure of extra-credit points in WPC 101 that finally got her to visit the center. “I had never written down any goals for myself really, and never had a clear picture of what I wanted to accomplish; I just wanted to pass,” she said. “Kasey sat down with me and helped me see the importance of goals and to be more confident in my ability to achieve more than expected. “I added my supply chain management degree because Kasey showed me how well it fit with my dream of work that would let me travel the world,” observed Walker, who plans to move to Australia and join a global company. Correa, who shares supervision of the center’s 75 coaches and works to develop programming and curriculum, said that Walker’s experience isn’t atypical. “Many students come in a little reluctantly, but they quickly feel a comfortable connection and are surprised by how many ways their coach can help,” he said. “They’re glad to suddenly have this other person in their corner who can help them accelerate their success. That’s the attitude that underpins all that ASU’s First-Year Success Center does, from its approach to success coaching to the red-carpet treatment it tries to give every visitor who walks in the door. Student coaches receive about 100 hours of training over an academic year while employed in the center. Why the emphasis on positive psychology? Training also addresses how to be a ‘first-level responder’ when a student is in crisis. First-Year Success coaches are juniors, seniors and graduate students who have at least a 3.0 GPA and who have been engaged on- or off-campus. “We also look for cultural competency and even resiliency — maybe someone didn’t have a strong first year but turned it around,” said Herrera. Last year the center received 500 applications for its open coaching spots. Dongnan “Jacky” Shao, a senior from China who is now in his second year working in the First-Year Success Center, said he leaned on his coach as a freshman to help him get familiar with ASU, to improve his English, and to get more involved on campus. Shao recognizes he’s grown in many ways being a coach. Former success coach Ana Licona, who went on to join the leadership development team in the Office of Presidential Personnel in the Obama White House after graduating, counts her time as a First-Year Success coach as “one of the most rewarding experiences ever! Qualitative feedback from coached students consistently puts the First-Year Success Center among the top-five ASU units in satisfaction surveys. An impressive 98 percent of coached students in fall 2016 reported their coach helps them achieve their goals and gave them a boost of confidence; 99 percent reported they can go to their coach for advice and that their coach understands them. In the fall, center staff expanded the VIP Suite programming for sophomores and developed targeted web resources and programs aimed at first-generation students and out-of-state students, two populations that may face additional barriers to success. Some ASU colleges have also begun partnering to embed First-Year Success coaching into their introductory courses and in residential communities. The word is getting out in higher education, Herrera said. First-Year Success Center staff are regularly approached by other units and universities nationwide to share their coaching and retention framework. In February, center leadership will present the ASU model at the 36th annual Conference on the First-Year Experience, in Atlanta, where Herrera (pictured below) will be one of 10 individuals recognized with the Outstanding First-Year Student Advocates award at the conference’s opening session. The award honors those doing exceptional work in student learning, development and success nationally. It’s co-sponsored by the National Resource Center for the First-Year Experience and Students in Transition, and Cengage Learning. Herrera, who earned a master’s in education at ASU and is pursuing doctoral studies in educational leadership, has also done advanced coach training and certifications from the Certified Coach Federation and the Coaching & Positive Psychology Institute. She is thrilled that coaching is beginning to be seen as having a natural, organic place in the university. To make an appointment with their First-Year Success coach, ASU freshmen and sophomores can call 480-965-3289 or email fys@asu.edu. ASU senior Jacky Shao, a business entrepreneurship and supply chain management major from China, schedules an appointment with one of the students he coaches — a freshman exploratory student from Chong Qing, China. Coaching can be done in-person or via phone, email or Skype. More than 21,000 ASU students have been supported in 50,000 coaching appointents since the First-Year Success Center was launched at ASU in fall 2012. On ASU's Tempe campus, students and coaches meet for appointments in Interdisciplinary B building. Marisel Herrera, director of ASU's First-Year Success Center, talks with senior Angelica Rodriguez, a success coach and the president of El Concilio, an umbrella coalition of ASU's Latino/a student organizations. First-Year Success coaches are often student leaders who are involved in student government, organizations and non-profits. 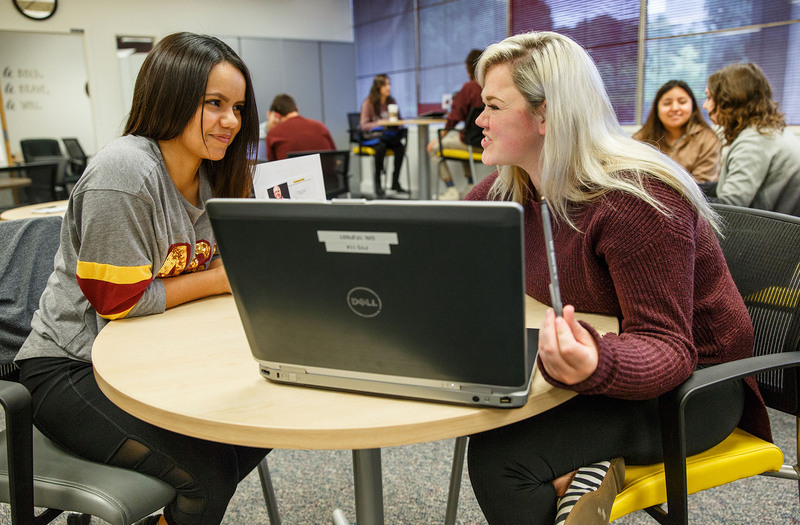 ASU freshmen and sophomores can meet with their success coaches in FIrst-Year Success Center spaces at the Tempe campus, Polytechnic campus, Downtown Phoenix campus and West campus. Over winter break, the former campus bookstore at Downtown Phoenix campus was transformed into a shared space for University Academic Success Programs (writing and tutoring help) and First-Year Success coaching.